Built by Mitsubishi, estimated date of assembly June 1943. Assigned to ? Kokutai. Crashed at Namkum beach near Kokopo. 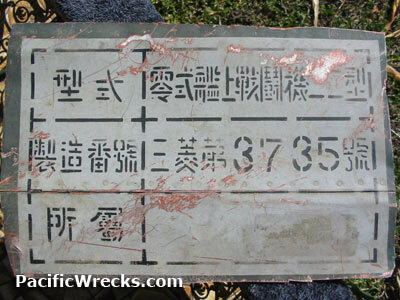 An expatriate Australian recovered the fuselage stencil along with vertebrae and amulets around 1960-1961. Later, the fuselage stencil was sold in a Brisbane auction house in the early 1980s. "From Jap Zero A6M. This panel was picked up personally by me at Namkum (?) beach area near Kokapo East New Britain Papua New Guinea along with vertebrae and amulets in 1960-61.